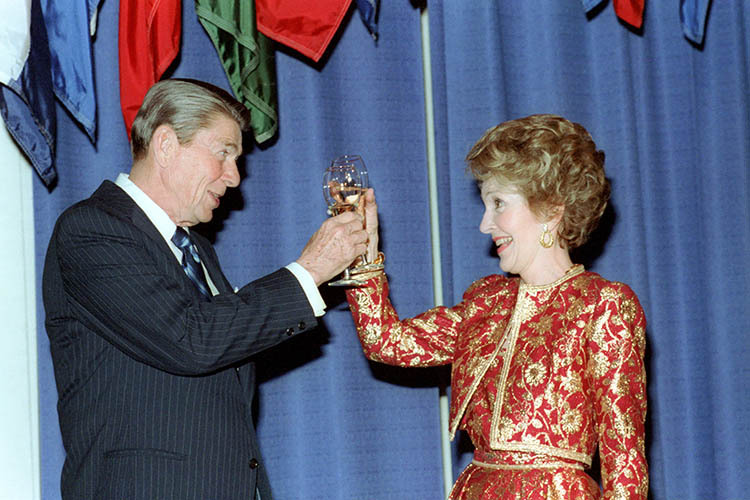 President Ronald Reagan & First Lady Nancy Reagan toast each other. Entering the oval office as president in 1981, Ronald Reagan assumed the role of not only the most powerful person on the planet, but as America’s ambassador-at-large. Whatever he said, whatever he ate and whatever he drank at home or abroad would be in tomorrow’s newspapers for everyone to read. And with this giant megaphone, the oenophile-in-chief was determined to promote the best vintages that the United States had to offer. “They are the best informed administration on wine this century,” declared John DeLuca of the San Francisco Wine Institute. Looking back, it is an education that began in 1947, when Reagan’s doctor recommended that he have a glass with dinner to help recuperate from a near-fatal bout with pneumonia. While never much of a drinker, the Gipper’s fascination with wine grew by leaps and bounds as he transitioned from Hollywood actor to politician. Beginning his collection in the early 1950s, Reagan’s wine cellar over time acquired many notable bottles including 1947 Lafite Rothschild, 1953 Mouton Rothschild, 1947 Haut Brion and 1962 LaTache. Of course, hosting the General Electric Theater had its perks, including a state-of-the-art cellar with thermostatic controls installed at Reagan’s Pacific Palisades home by his bosses at GE. But with his sights set on Sacramento, the focus of the actor’s wine collection shifted from the vineyards of France to a more local setting. 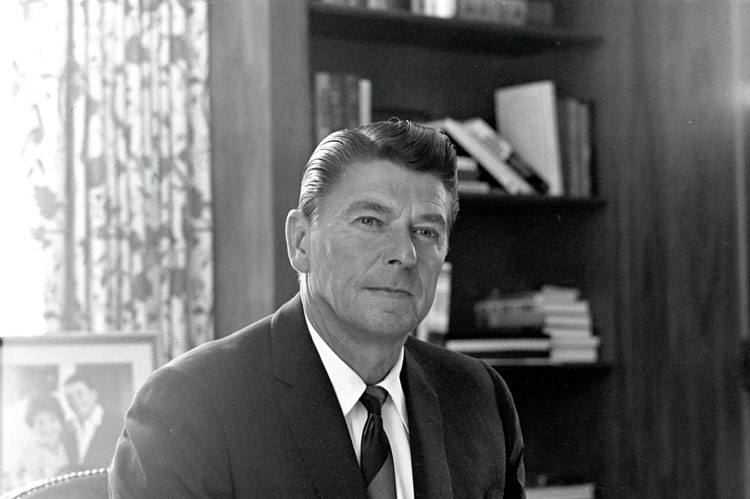 As Governor of California, Reagan enthusiastically promoted his state’s booming wine industry. After becoming Governor of California in 1967, Reagan suddenly stood at the helm of a state experiencing a wine making renaissance. After nearly four decades of producing mostly dreadful fortified and jug wines, a whole new generation of vintners began turning the corner. And within a decade, the Golden State became one of the finest wine regions in the entire world, defeating the best France had to offer in numerous international competitions. Adding to this new found sense of confidence was Governor Reagan, a key ally in promoting California terroir beyond the state’s borders. One memorable story dates back to 1972, when the Oakland Athletics battled Cincinnati’s Big Red Machine at the World Series. In a friendly wager against Ohio Governor John Gilligan over the fall classic, Reagan bet two bottles of California-produced chablis and burgundy against a bushel of Buckeye State corn. After seven grueling games, the A’s emerged victorious, denying Gilligan the championship and more importantly, the opportunity to enhance his palate. Eight years later, Californians rejoiced at yet another victory as Reagan won the keys to the White House, defeating President Jimmy Carter decisively in the Electoral College. And to celebrate, on Election Day the Gipper told various media that he personally ordered four cases of Jordan Winery’s world-famous 1976 Cabernet Sauvignon. It seemed that with the move from the Governor’s Mansion to 1600 Pennsylvania Avenue, Reagan’s victory put American winemakers center stage. “He really considers himself to be a wine buff,” proclaimed his deputy chief of staff and wine consultant Michael Deaver. Personally committed to bringing back the elegance of state dinners lost during the Carter years, it wasn’t uncommon for both the president and first lady to sample several suggested wines before the big night. If ever unsatisfied with the choices, Reagan often made the executive decision to include one of his own personal favorites to the list. During a state dinner honoring Prince Charles, one of the commander-in-chiefs preferred bottles – a 1970 BV Private Reserve was added at the last minute. “The president literally made the final decision,” remembers Deaver. 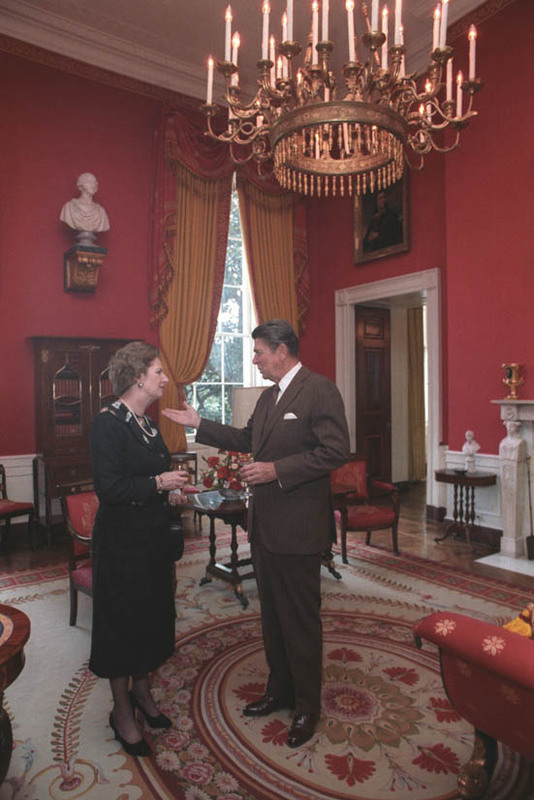 (Left) President Reagan enjoying a glass of wine with Prime Minister Margaret Thatcher in the White House Red Room. 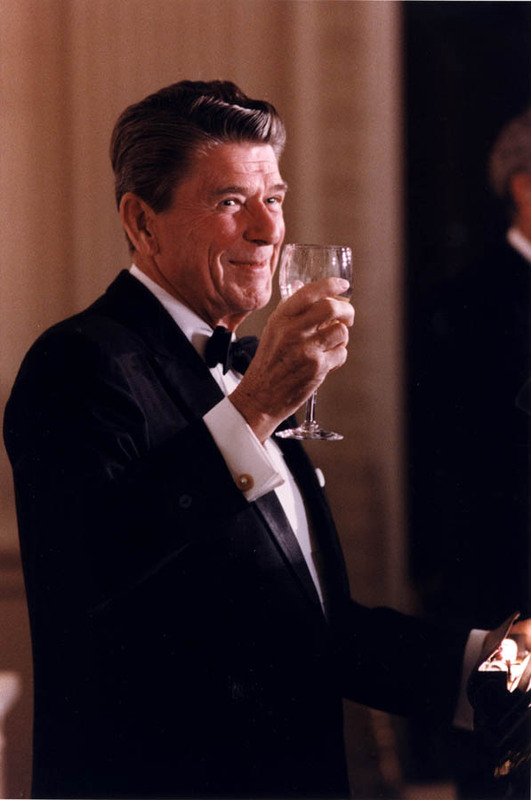 (Right) Photograph of President Reagan toasting at a State Dinner for Australian Prime Minister Malcolm Fraser. And with every selection came millions of dollars in free publicity for that winery. When Nancy Reagan admitted her fondness for Kendall Jackson Chardonnay in a newspaper interview, sales skyrocketed. Likewise, when the president toasted Queen Elizabeth II at a dinner in San Francisco with 1976 Jordan Cabernet, it became all the rage in the wine tasting circles. It was such a popular selection that even Canadian Prime Minister Pierre Trudeau ordered an entire case after sampling it at a White House state dinner. What wine(s) have you tried from this posting?